I’ve been interested in using WordPress as a web application foundation for some time now (to the point where I’m almost annoying myself when talking about it). But with features like the REST API being made available – via plugin or inclusion in core – and with WordPress continuing to grow market share, I think that it’s viability as such continues to make sense. Maybe it makes more sense now than it did years ago. 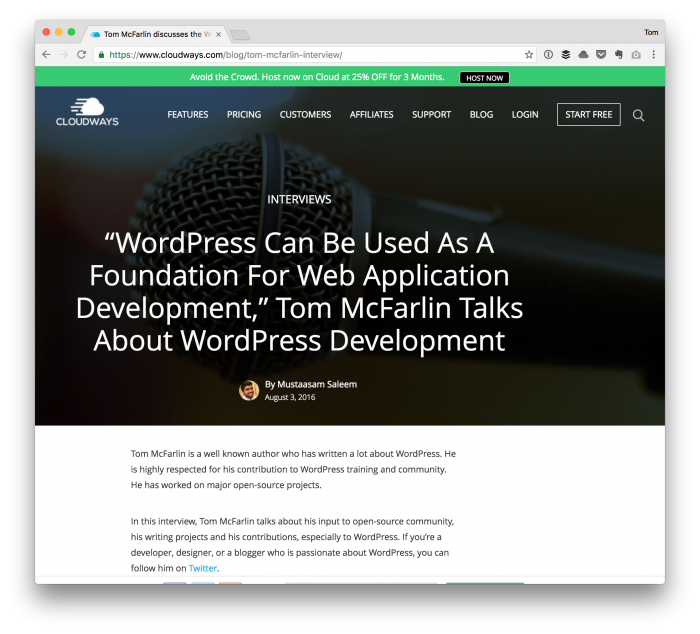 Regardless, I had the opportunity to talk with Cloudways earlier this year in a relatively in-depth interview and the topic of WordPress as a web application foundation was part of the interview. Since it’s something I’ve been talking about, I thought why not include some of that content here? WordPress is a stand-alone application all its own that provides APIs on which we can build things. Frameworks are not standalone applications and they provide scaffolding by which we can build things. For example, you can install and run WordPress out-of-the-box. You can’t do this with, say, Laravel or Rails. The latter are frameworks. Tell us a bit about yourself. We learned that you are a credible web developer. What was the main reason of pursuing a career within the respective field? When did you first discover WordPress? If there was no WordPress then what other options would you have considered? You have been contributing in open source communities since a long time. You’ve also worked [with .NET]. How will you compare proprietary with open source communities? According to your experience, what will you suggest for plugin and theme beginners? You’ve a vast experience in WordPress Development. Can you share some of your most proud project you’ve worked on by far? The core of WordPress is not known for its speed. What best practices do you think should be used to improve the speed of WordPress? What about WordPress security? Do you think it has been reduced with the release of its newest version? We’ve seen you attending and speaking at many WordCamps. What did you learn from there and how these meetups are beneficial for you as well as WordPress Community? Tom, you’re a web developer, WordPress theme & plugin developer, blogger and a contributor of the WordPress community. What are your lifehacks to manage all these stuff at the same time? And there are a few others outside of these listed above. But hopefully, this is enough to give you a picture as to all of the things we talked about. If you’re interested, please feel free to check out the entire interview. You can leave feedback on the original page, contact me via email, via Twitter, or maybe via even, gasp, Instagram.